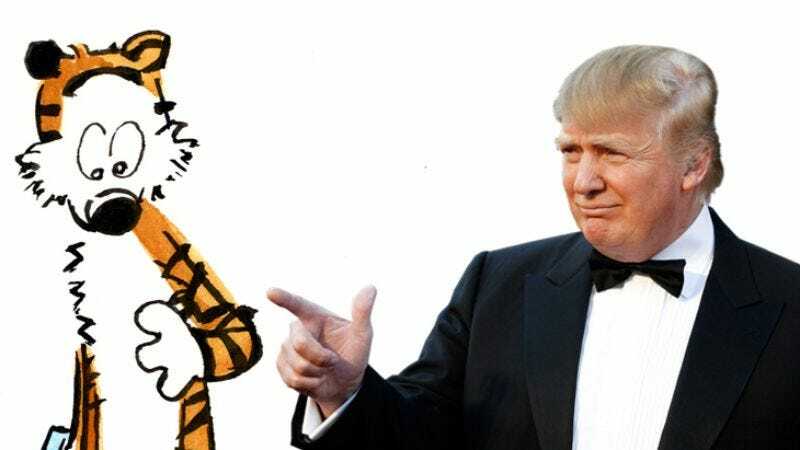 The 20th anniversary of the end of Bill Watterson’s beloved comic strip Calvin & Hobbes is fast approaching, and the denizens of Reddit are celebrating by replacing one of the strip’s two title characters with the most divisive candidate in American politics today. As reported by Max Knoblauch, an entire subreddit devoted to “Donald And Hobbes” has risen from the example set by a Redditor called eucalyptusfire, who had the bright idea of substituting the bizarrely coiffed, 69-year-old real estate mogul for the spiky-haired, 6-year-old elementary schooler Calvin. As it turns out, Calvin’s inveterate selfishness, greed, and impetuousness translate so easily to Donald Trump that it is difficult to discern between Watterson’s comedic dialogue and an actual, verbatim Trump tirade. Both the rambunctious brat and the Republican candidate believe, for instance, that “happiness is being famous for your financial ability to indulge in every kind of excess.” In retrospect, then, Donald Trump has actually been living the kind of life of which Calvin could only dream. Knoblauch suggests that the reclusive Watterson “wherever he is, is cringing” at seeing his creation degraded in this fashion. After all, the cartoonist took a distinctly non-Trump-ian approach to his handling of the popular Calvin & Hobbes, eschewing merchandise or animated spinoffs and ending the strip after only 10 years, while it was still at its peak. But one might hope that Watterson would find some amusement in seeing that his famous character’s worst traits have found a new home in a man who could, a year from now, be the next leader of the free world. For those interested in exploring the world of “Donald And Hobbes” further, there is a half-amusing, half-depressing gallery here.